Despite the fact that I make a living writing electrical engineering software, I am not a gadget guy or early adopter of technology. Thus, when a commenter on the Six-Pack Equivalent Calculator post requested an Android phone version of the SPE tool, I filed it away as something I might pursue sometime, but since I don't have a smart phone myself, it never got very high on my list of priorities. In case you're unfamiliar with the SPE, it is the legal tender of It's Pub Night. When trying to compare the relative price of differently-sized bottles, kegs, or glasses of beer, it helps to convert them into a unit we're all familiar with -- the beloved six-pack. Before anyone goes on a rant, let me clarify that I wouldn't expect snifters of rare Belgian monk nectar to cost the same as a six-pack of Miller High Life. 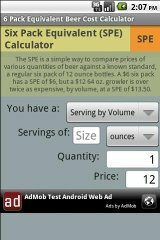 This is just a tool for normalizing prices so you can understand what kind of value you're getting for your money, or compare two similar beers of unequal volume. Will be downloading this on my Tablet tonight. An app that simple would probably take me an afternoon to write. It's super easy. @Shawn: Yep, nothing to it. All I ask is 10% of everything over 50K. Hmm...looks like the "gMarket" on my GTablet is not the real android market, and the browser does not understand "market:" links. Thank you for the motivation to root my new toy and install a custom rom. happy to have a home system.